Remodeling is our specialty from bathrooms and kitchens to great rooms and outdoor living spaces. We do it all. Renovating your bathroom is a big investment in time and money, so it’s important to do your homework before you start. Creating a budget and searching for the right designer and contractor are important pre-renovation tasks, and so is coming up with a bathroom wish list. By doing this, you create a clear vision of how you want your revamped space to look, work and feel. If you need some inspiration, reading up on the latest bathroom trends can help you get on track and pinpoint what you want and need. And there’s no better place to start than with these four 2016 trend predictions. Wood. Believe it or not, timber is continuing to flourish in the bathroom. The release of new purpose-designed timber products enables us to bring its natural warmth into a previously wood-tabooed space.If you’re interested in working wood into your bathroom, take a cue from this striking example and consider using the material in unexpected ways, such as on the wall. Cool, calm tones. 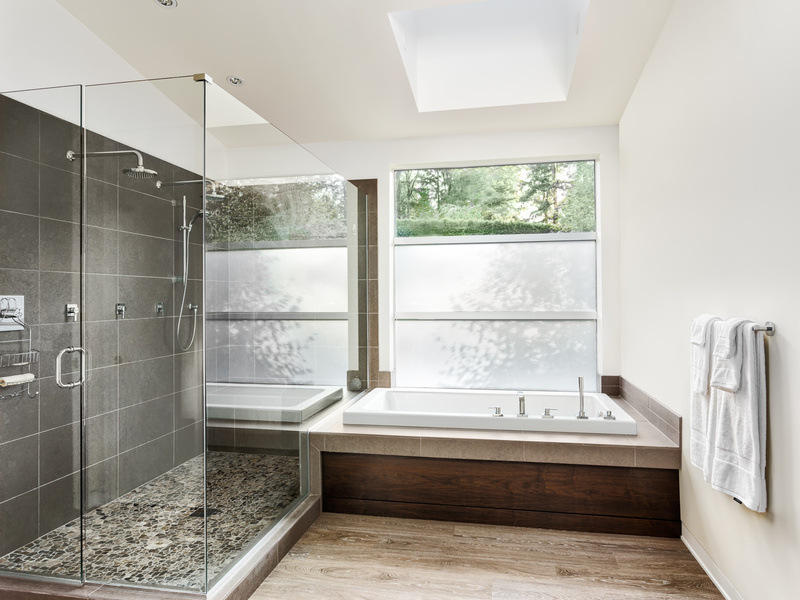 Cool tones that create a tranquil, zen-like environment are a big in the bathroom in 2016. Blues and emerald greens are top picks when it comes to adding color. Pair these with crisp white and touches of wood for a fresh, uplifting feel, or team them with metallic accents and rustic materials for a design that’s edgier and more sophisticated. Timeless tiles in unique patterns. Patterned and geometric tiles may have been hugely popular over the past few years, but that trend is changing in 2016. This trend is giving way to more plain, basic tiles will return to the spotlight, but with a creative twist. These timeless tiles, such as subway tiles, will be laid in unusual patterns in order to create enduring appeal.Not sure which pattern to pick? A classic herringbone design will lend a dose of visual drama and chic appeal. Basketweave and windmill patterns are other designs you may want to consider. Natural vibe. Wood isn’t the only natural material that will be trending this year. Expect to see earthy materials like natural stone and river rock, not only on your floor and walls, but also on your vanity tops, sinks and baths, feature walls and bathroom furniture.